Klein Tools Journeyman™ JTH Series Hex key set with stand, includes 3/32-Inch, 7/64-Inch, 1/8-Inch, 9/64-Inch, 5/32-Inch, 3/16-Inch, 7/32-Inch, 1/4-Inch, 5/16-Inch, 3/8-Inch hex size keys and T-handle plastic holder. 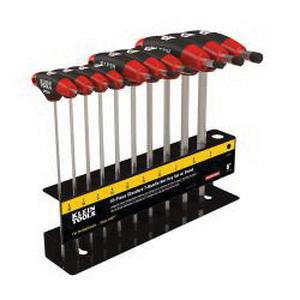 These hex keys with T-handle design, have soft touch grips for maximum control and comfort. These hex keys features treated steel construction for rust and corrosion resistance. These 9-Inch arm length hex keys employ blade through handle design for high torque applications.